Wellington had a workhouse by at least 1748 when the poor were "farmed" by a tailor named Thomas Hazlehurst who received a quarterly payment in return for providing inmates with food, clothing, medical care, and — if required — burial (Baugh et al, 1985). He also obtained income from the inmates' labour. The workhouse was used from 1748 by the parish of Newport and in in 1750-51 by Berrington. The workhouse house up to 56 inmates in 1776, and in November 1797 the residents comprised 10 men, 14 women, and 20 children. The number of inmates fluctuated considerably, from 186 in April 1801 down to only 39 in October 1802. In 1797, the workhouse was relocated from Street Lane to the southern side of Walker Street. High Ercall (Ercall Magna) had a workhouse at Rowton. County of Salop: Bolas Magna, Ercall Magna (2), Eyton-on-the-Wild-Moors, Kinnersley, Longdon-upon-Fern, Preston-on-the-Wild-Moors, Rodington, Upton Waters, Wellington (5), Wombridge (2), Wrockwardine (3). Later Addition: Hadley (from 1898). The population falling within the Union at the 1831 census had been 17,945 with parishes ranging in size from Longdon-upon-Fern (population 109) to Wellington itself (9,671). The average annual poor-rate expenditure for the period 1833-35 had been £6,207 or 7s.11d. per head of the population. 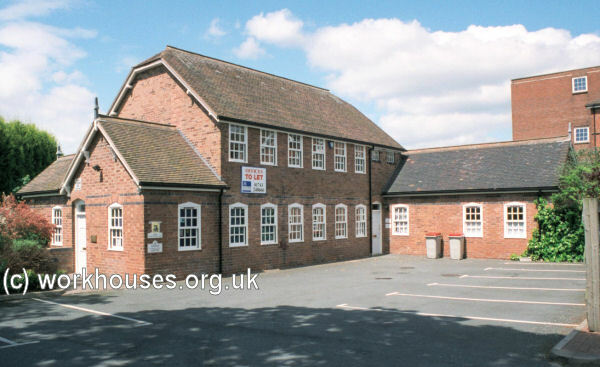 The Wellington Board of Guardians retained and enlarged the old Walker Street workhouse to accommodate 160 adult paupers, while up to 100 children were housed at the former Ercall Magna parish workhouse, at Waters Upton. The former Wrockwardine parish workhouse was also rented between 1838 and 1841. In 1842, the Commissioners investigating the employment and conditions of children in mines and manufactories, discovered that workhouse boys, some as young as eight, were being sent on "apprenticeships" of up to twelve years working in coal mines. As a result, some unions in the coal-mining districts of South Staffordshire and adjacent areas were asked to provide detailed information on the children who had been apprenticed in the mining industry in recent years. Stourbridge recorded only two such cases: in 1841, Richard Morgan, aged 10, was apprenticed until the age of 21 to John Blakeway, butty collier to Messrs. Grazebrooks, Netherton Colliery, Dudley; in 1842, Cornelius Deeley, aged 14, was apprenticed until the age of 21 to Thomas Gould, butty collier at a British Iron Company mine. The Stourbridge union clerk, Henry Duignan, also assured the Commissioners that any boys so apprenticed were believed to be properly treated by their masters. In 1874-5, a new union workhouse was erected on the north side of Street Lane (now Holyhead Road) at the south-west of Wellington. It accommodated 350 inmates and the architects were the partnership of Bidlake and Fleming. The workhouse location and layout are shown on the 1901 map below. The new workhouse had a three-storey T-shaped main building and a number ancillary blocks including an infirmary, fever hospital and school. Wellington main building from the south, 2001. Wellington casual wards(?) from the south, 2001. After 1930, the Street Lane site became a Public Assistance Institution under the conyrol of Shropshire County Council. During the Second World War, patients from several Birmingham hospitals, including the Children's Hospital, were evacuated here to avoid German bombing. 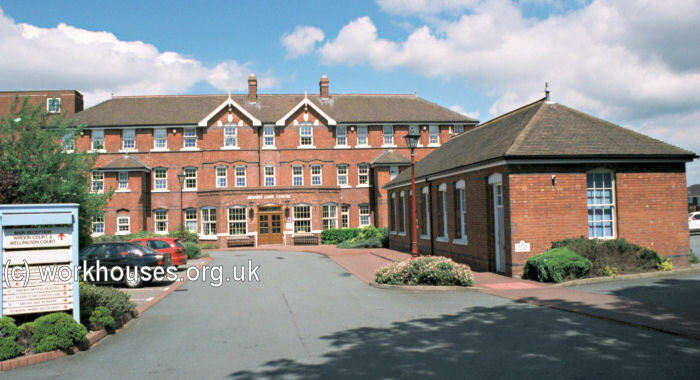 In 1948, the establishment joined the new National Health Service as the Wrekin Hospital. In 1993, the main building was converted for use as a nursing home. From 1836, the union's offices were located at Walker Street. The new board room at the Street Lane workhouse was apparently not used for board meetings because of its distance from the town. In 1897, the Guardians acquired new adminstrative premises at Edgbaston House also on Walker Street, later a solicitors' offices. The Walker Street workhouse was later occupied by the Union Brewery, and some of the surviving workhouse buildings now form part of the Wellington Library. The Wellington Union established a children's home at Brooklyn House, 135 Watling Street, Wellington. In 1924, it could house 48 children, with Robert Langley as Superintendent and Mrs S.J. Langley as Foster Mother. By 1929, the home had moved to The Mount, Haygate Road, Wellington. Shropshire Archives, Castle Gates, Shrewsbury, Shropshire SY1 2AQ. Please note that records may contain gaps or have access restrictions - please check before visiting. Limited holdings include: Guardians' Minutes (1836-1928); Children's Home Committee minutes (1913-30); etc. Baugh, GC et al (1985) A History of the County of Shropshire: Volume 11: Telford (Victoria County History).